Nonvianuk River is another very popular fly fishing destination in Alaska. People come to the various rivers from all over the world to catch the large Salmon that run these rivers each year. The Fly fishing can be amazing during these runs, and the season is short so you need to plan your trip early while guides are still available and the lodges still have accommodations available. There are many Alaskan fly-fishing guides, charters and fishing lodges available to choose from. Salmon fly fishing a very popular sport in the state, and many people travel to the many salmon filled streams every year. If you have never fly fished for salmon you do not know what you are missing. Why not give a fly fishing vacation a try? Although the Novianuk River is only 9 miles long it is a major stream to other tributaries on the other side of Novianuk Lake, which includes the Kulik Lake and Kulik River. Because this is an access point to other locations this river gets loaded with the various salmon coming to spawn. It is home to one of the best Silver fisheries in the Bristol Bay area. The River ends when it dumps into the Alagnak River about 20 miles after that river begins. There is a lot of Salmon traffic in these waters which also means the Trophy Trout hang out in these waters as well looking for easy meals during the spawning season. This river is not as well known as some of the other rivers in Alaska, but all of the rivers and lakes in Alaska offer something for everyone. 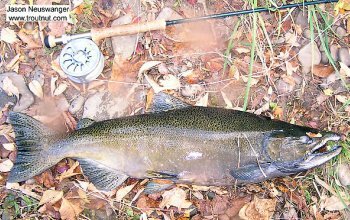 Whether it is fly fishing for monster trout, or fly fishing for Salmon, you will certainly enjoy the thrill of hooking into these large fish. There are many Alaska fishing guides in the area that would see to it that you have a great experience. There are many guides available throughout the state, and they are familiar with many of the rivers. This is what they do for a living and most of them are quite good at their job. They will get you to where the fish are, provide equipment and teach you how to fish form these massive Salmon. Leave the Nonvianuk River and go to Alaska page.